Robinsons is five venues in one, each very different so whatever you�re looking for you are sure to find it. The saloon bar can be found at street level and is a great meeting place, leading through to Fibber Magees, a spit and sawdust bar, packed to the rafters with old Irish artifacts and traditional musicians performing every night. The basement floor is home to BT1, which boasts the funkiest unisex loos in the city, cosy curtained booths and stylish seating. Upstairs you will discover Bistro where Lunch, Early Evening & Evening Menus are served daily. Finally Roxy Nightclub is situated on the top floor there DJs play dance anthems and retro favourites every Friday and Saturday night. Have you got Google Earth on your computer? If so, then download the Google Earth view of Robinsons. Is this the wrong position for Robinsons? If you think so, then modify its position. Click / Tap the button above to get directions from where you are to Robinsons. Fantastic place to come for a warm welcome great laughs and entertainment and great food.. The karaoke in BT1 is great.Ellie is a stunner.Shane does an excellent job and Paula knows how to keep the punters liqoured. myself and my daughter were struggling with suitcases going to the bus station across the road. too early for the bus we decided to have lunch but couldnt carry the cases any further. i left my daughter with cases and asked the doormen for help!one came with me to get cases and then carried them upstairs where we had a lovely inexpensive tasty lunch served by extremely pleasent staff. highly recommend on all counts. special thanks to the excellent staff for all their help. this was june 2010.
lol i gave the girls 100% I was there! 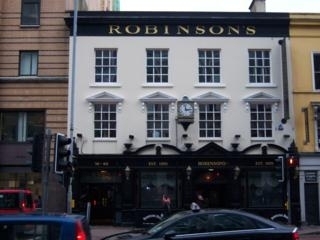 I visited Robinsons a few times back in the 90's - and it was just a fantastic place - the people were great and I loved it - Go there its unique...Wonderful. I used 2 lov the rock bar they had in the basement. Wen they closed it the management said it wuz because of 2 many fights. Wot a load of c--p if thats the case why is the top floor still open???????? Just reading the reviews. My mate and I used to go the night club every Satuarday. It used to be great, great when it was where the resterant is now. Since then it had seemd to become a pisshole, It always seem to be sticky and couldn't bring your drink with you. I understand its incase you put illegals into it or hit someone, what if a bouncer wasn't watching and someone does? The old bouncers were brillant still see three of the old bouncers regularly. I haven't been there but the bouncers now all seem to look a bit like jerks only after looking at the girls not doing the job. The last time I was there there was a guy that should've been shown the door long ago was still there. The Guinness maybe good but the bar has went to hell. Tell me how much is it in now and how much are WKDS? I remember it was 3.00 for a drink of WKD and 5.00 in. As I left the Europa hotel I followed a bevy of foxy minxes, after they hollered 'come over here big lad', at me and my buddies.We all headed into Robinson's Bt1 bar. This chic basement was absolutely rockin' with friendly smiley faces all around. The dj fairly had them bouncin' and swingin'. Went to Robinsons last Fri with friends from work we had a brilliant night. Guinness fantastic! music even better,(Hyland Paddy) we danced all night . Going back this Fri night!!!!!!!!!! It's now an overpriced dump. Was in there on Saturday night and had a great time, friendly locals and good music means I will def be going back next time I'm over in Belfast just a shame it closed so early! the lady manager doesnt have a clue at all how to run the restaurant. this place needs new management, new staff and new chefs. get that sorted and it would def be a place to be. Like did i not see the restaurant manager working in the lifeboat??? Been to the Bistro 3 times in the past 6months. At luchtime menu was good and so was service. Unfortunatley menu does not change much for the evening. Twice we went there in the evening food was just average, but the main reason I will not be back is the staff. Both times they have been positively rude and seem to panic if they have more than a few tables occupied time. They dont even give you time to sit down before they demand your drinks order and when taking food order can hardly give you the time of day. Prices are cheap enough but would advise going to one of the many restaurants in the area which may be a bit more expensive but staff more human! Bouncers are out of order, think they own the place. Cause more trouble than they prevent, and are never there when something actually does kick off. Shame - used to be one of Belfast's best bars. need a credit card to have a drink in this bar.not be back,first and last time not be back. well i totally agree with tom's comment although i am friendly with the waiter in the bistro and talk to him everytime im in. the food is fantastic and good value, but there has been a change in menu, although i wasnt afraid to ask why, what i found out was that there is another new team of kitchen staff in and theyre now getting on their feet so expect the menu to be changing shortly... the waiting staff know exactly what they are doing and are extremely friendly and get you what you want; in my experiences there they know more than the management do!!! Up until recently (say two months ago) the bistro used to serve a fantastic array of delicious and well presented dishes which kept us returning as regular customers. Then something changed, we presume chef/kitchen staff, but I'm now left regretting ever recommending it as an eatery (Ronald McDonald can sleep at night once again). Serious nose dive. Apologies if the kitchen arrangements haven't changed (perhaps theres a flavour/menu fast or something). Not what it used to be. It used to be great with some nice good friendly bouncers. The last time I was in there with friends the place was full of drunks who should've been thrown out by the bouncers. The old bouncers that were there before the current, never let this happen. Plus it should've never been moved to the top floor, that is what made it look and feel less of a place to be. I haven't been back since. Sorry but you can't get these regulars back. It has become a bad nightclub to go to now and it has been ruined by the people who took over the rains from the old bouncers of the old days. I don't blame the bar staff, I don't blame the management I only place the blame theose bouncers who let the druggies and losers in and drive the decent people away. OMG, I was just charged £7.30 for a double vodka and redbull...this is no bull! (scuse the pun) I recommend you avoid that particular drink! Unbelievable! If you are into rock music,avoid this place. But the beer is great, and that's all that matters! fibbers is the best! you are always sure to meet a handsome foriegner, drinking guinness! best place for a bit o proper slap yer thigh and diddley dee craic! beware of the old men, a tad fresh! lots of old weird crazy men in fibber s n a fri afternoon but the food is gd!